The success of any company, or any team for that matter, is only possible through everyone’s contribution. This is why many managers, coaches, and teachers use Team Building activities to bring team members and co-workers together and foster a better, more collaborative environment. However, this is often easier said than done. Developing a successful team that can work together as one unit requires a strategic team building plan. 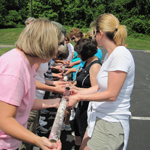 Here are 10 Team Building Tips for Corporations, Social Groups, Businesses and More! In order to build an effective team, leadership must clearly communicate its expectations. The organization should demonstrate purpose and each member must understand why the team was formed, including what goals they should work towards. They must also be aware of why they are participating and how using laid out strategies will impact the organization in serving its purpose. Everyone must be committed. Everyone must contribute their effort towards one purpose. For this to happen, every member has to perceive their efforts as valuable, an inseparable component to the organization’s success. They must feel emotionally invested in the company’s goals. As aforementioned, team building is based off a clearly communicated purpose and vision. In order to accomplish set goals, the team must have the needed capacity in terms of manpower, skills, knowledge, and ability to address presented problems. Any absence of these capacities should be coupled with platforms for accessing aid and assistance. A successful team has to exhibit strong character of responsibility and understanding of what they are dealing with. The team should communicate its goals, and design missions and strategies for accomplishing those goals. A successful team should also have a system of measuring whether outcomes match expectations and set up coordinating groups to see to it that goals are being accomplished. Individual team members should have enough empowerment and freedom to take creative actions towards serving the team goals. However, each member should be aware of their predetermined boundaries. The organization should define team authority and accountability and must always be upheld. Good communication is necessary for team success. There must be clear paths for reporting and receiving feedback. Each member must be well-versed on the tasks they are responsible for, including priorities and contribution. Interpersonal relationships and clear regular communication among team members is also paramount to success. The team members must understand the process of team building, as well as the roles and responsibilities of its members and leaders. Processes such as goal setting and outcome measuring should be approached jointly for collective effort. Team members should understand the responsibilities required for success and should avoid blaming others for lost opportunities. Allowing creative innovation in the group is an essential part of team building. Team members should be encouraged to be innovative, and provide unique new ideas. Valuing these new ideas and innovations will expand problem solving ability. Every group needs leaders and centric coordination which provides the assistance needed to achieve success. Resource allocation, setting of timeframes and priorities, and seamless communication between different departments all require coordination. Members must also know when to hand their work to the next process in the chain of activities. Terrapin Adventures provides professional team building programs to help your employees better collaborate and perform as a cohesive unit. You can take advantage of our Adventure Park – Zip Line, Giant Swing, Climbing Tower, low and high ropes courses – or we can come to you. Located between Baltimore and Washington DC, Terrapin Adventures is uniquely suited to provide a Team Building solution for any company, both onsite and offsite. This entry was posted on Friday, January 30th, 2015 at 6:03 pm. Both comments and pings are currently closed. I would like to do a team building activity that requires creativity. My boss is actually looking for a good team building activity to do with everyone. I’ll suggest we do something that also requires communication with all the members. Thanks. This is some really good information about team building. I liked that you pointed out that you should make sure that you allow creativity when you do these activities. It does seem like that would allow people to bond better as well.